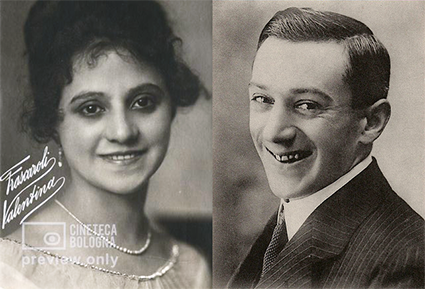 Power couples of Italian silent film | Silents, Please! It may not be a surprise that the Italian silent film industry was chock-full of couples. Today, for the Feast of Saint Valentine, let’s take a look at these duos with lives spent in film as well as love—sometimes both at the same time. 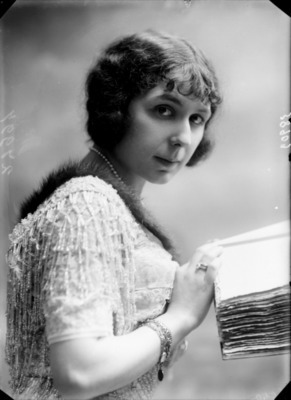 Polish-born Soava Gallone was an accomplished and successful film diva. Though several of her films survive, she is today most known for the delightful Maman Poupée | A Doll Wife (Olimpus-Film, 1919), the film of hers which has been most readily available to researchers. Her husband Carmine, whom she married in 1912, was her key collaborator, directing her in almost all of her film appearances. The productive Carmine was one of the leading directors of the Italian silent era, notably directing almost half of Lyda Borelli’s film appearances. He continued to have a very successful career in the sound era, with a prolific filmography that includes the notorious Scipio Africanus (1937). Versatile character actor and prolific film director, Emilio Ghione is best known for his character Za La Mort, who he portrayed in sixteen films or film serials between 1914 and 1924. Kally (Calliope) Sambucini was his partner in art as well as life: almost all of her film work was made in collaboration with Ghione, and she appeared with him in all but the first Za La Mort film, portraying his companion Za La Vie. 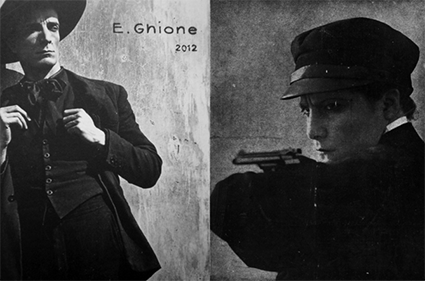 Their partnership began in 1915, and would last until Ghione’s death in 1930. I’ve written about the Za La Mort film Anime buie | Dark Souls (1916) here. Like many of the couples detailed in this post, Gys and Lombardo were an actress-director couple. 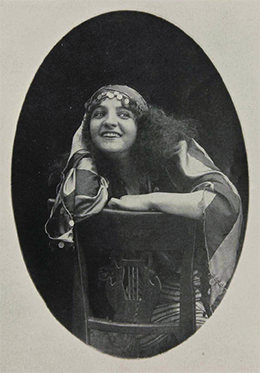 Gys was already a successful actress by the mid-teens, with her performance as the Madonna in Christus (Cines, 1916) generally considered to be her breakthrough role. 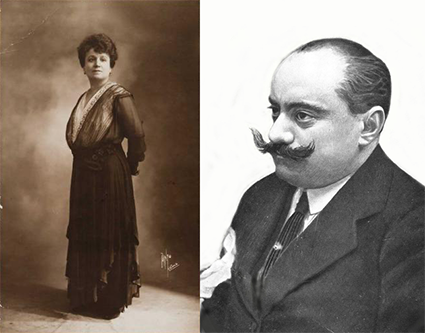 Lombardo was an early devotee of the cinema, becoming involved in the film distribution business in 1904, and founding the magazine Lux in 1909. In 1919 he established Lombardo-Film, for which he engaged Gys as the prima attrice. 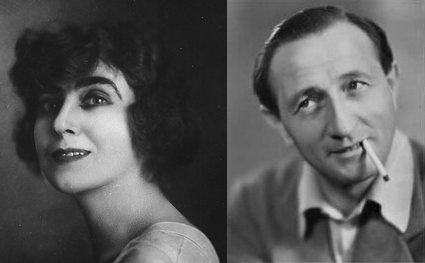 Together they made many successful films, including I figli di nessuno | Nobody’s Children (1921), La trappola | The Trap (1922), and Santarellina (1923). Lombardo Film also produced the string of Neapolitan comedies that Gys made in the 1920s. Gys and Lombardo’s union was lifelong. Jacobini is one of the big stars of the Italian silent cinema: perhaps not a diva in the classic sense, but a very well-liked and successful actress. Having already achieved success as a poet and writer, Oxilia was a rising star as a film director when he died at the front in 1917, aged only 28. 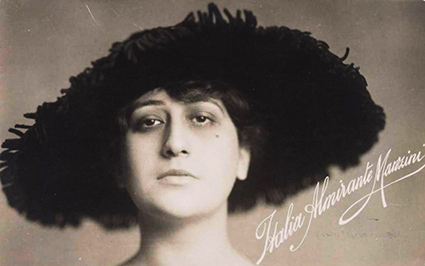 The next year, Jacobini would portray Dorina in the second film adaptation of the 1911 operetta Addio giovinezza!, for which Oxilia co-wrote the libretto. Jacobini and Oxilia worked together on several films, including Il focolare domestico (Savoia Film, 1914), which you can watch here. Jacobini and Righelli’s association began in 1920, after Jacobini became the prima attrice at Fert Film. Righelli, a leading director of the time, was the main director for the production house. 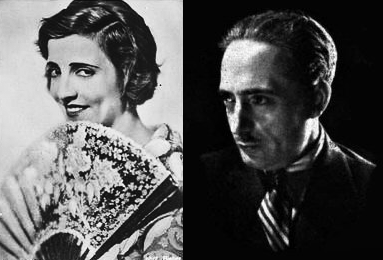 The two worked together on several films, including the extant titles La casa sotto la neve | The House under the Snow and Cainà: l’isola e il continente | Caina: the Island and the Continent, both 1922. 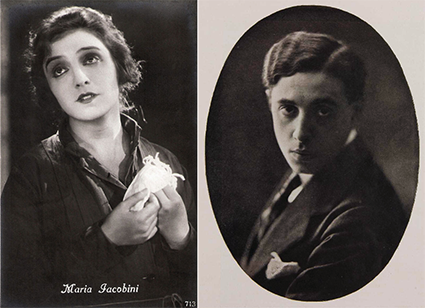 After the Italian film industry tanked in the early 1920s, the two decamped to Berlin to continue their careers, where Jacobini made such films as Maman Colibri and an adaptation of Tolstoy’s The Living Corpse (both 1929), while Righelli directed prolifically. During this time they founded Maria Jacobini-Film GmbH, which yielded a single title, an adaptation of La bohème. Jacobini is most famed for her silent films, but continued to work in the sound era in character parts. Righelli directed the first Italian talkie, La canzone dell’amore | The Song of Love (1930), and continued his successful directing career until the late 1940s, near the end of his life. A seminal couple of the pioneering days of Italian cinema. Mario Caserini was an early employee of Alberini e Santoni, which would become Cines, and in those early days specialised in classic literature adaptations (e.g., Shakespeare) and historical films. His vast directorial experience includes stints at Ambrosio, Gloria, Tiber, and Palatino. Perhaps his most lasting legacy is his direction of Ma l’amor mio non muore! | Love Everlasting (Gloria-Film, 1913), the Lyda Borelli vehicle often considered the first diva film. For her part, Maria Gasparini was a classically trained dancer and theatrical actress who went on to work extensively in film. Her filmography includes titles like Otello (Cines, 1906), the first film adaptation of that play, Christus (1916), and indeed Ma l’amor mio non muore! In 1912 she appeared in short film La ribalta | The Stage, which film scholar Stella Dagna describes as Mario’s “most sincere tribute to Gasparini”, celebrating a relationship where “the man has technical ability but the woman has creative genius”. Diana Karenne was an extremely talented actress who also wrote and directed, as well as being an accomplished graphic artist. She was considered the most cerebral actress of her time, and I find her extremely interesting—I’ve said it before, but it’s truly regrettable that so few of Karenne’s films survive, and none of her directorial work. After working as a journalist and playwright, Pasquali founded the production house that bears his name, which found success with the Polidor series of comic films acted by Ferdinand Guillaume. Pasquali discovered Karenne, not well-known at the time, gave her her stage name (Karenne was born Leucadia Konstantin), helped launch her career, and supported her during the many censorship problems with her films. After a lengthy illness, Pasquali died in 1919, aged 36. Maria Carmela Bonicatti arrived at her stage name of Carmen Boni on the advice of her friend Diana Karenne. Boni established a successful career on the Italian screen before seeking further opportunities abroad in the mid-1920s, as so many Italian film industry people did, although she returned to Italy for films like La grazia (1929). For me, Boni is an important European star of the 1920s: talented, naturalistic, incredibly charming. Certainly an actress I’d like to see more of than I have to date. Boni was a fresh, modern star: at European Film Star Postcards, Paul van Yperen compares her appeal to that of Clara Bow and Louise Brooks. Among her film performances are several ‘trouser roles’, such as L’ultimo lord | The Last Lord (Cinès-Pittaluga, 1926), Scampolo (Nero-Film AG, 1928), in which she plays a gamine Roman orphan, and the wonderfully-titled La femme en homme | The Woman Dressed as a Man (1932). Due to the fame of Louise Brooks, Genina is probably most well-known internationally for early sound film Prix de Beauté | Miss Europe (FR 1930). However, I’d rate Genina extremely highly among the directors of the Italian silent screen—I’ve really liked all of his films that I’ve seen. He has a deft touch, helped by the fact that he worked with some of the best talent of the time. Boni and Genina separated in the early-mid 1930s, which prompted an unsuccessful suicide attempt by Boni. She made several sound films before virtually retiring; Genina kept working prolifically, becoming one of the leading filmmakers of Fascism. 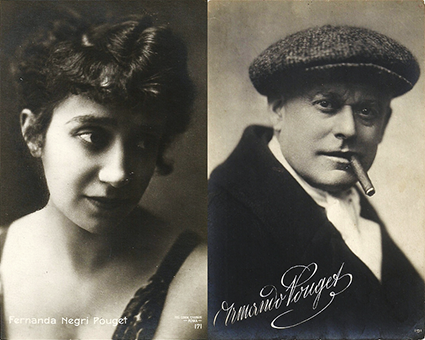 Frascaroli and Deed were early and prolific stars of the Italian silent cinema. The diminutive Frascaroli played in comic and dramatic roles alike, including the ‘Gribouilette’ comedy series; according to Angela Dalle Vacche, Frascaroli also used the screen name “La Farfalletta” (Little Butterfly). Deed’s reputation rests on his performances as his comic persona Cretinetti, whom he portrayed in close to a hundred films. Also notable is his science fiction film L’uomo meccanico | The Mechanical Man (Milano-Film, 1921): Deed did triple duty as director, actor, and writer, and Frascaroli also appears in the film. Luciano Albertini made his name as an athletic daredevil actor: in his film series as Sansone (Samson), he was something of a rival to Maciste and the other strongman characters. 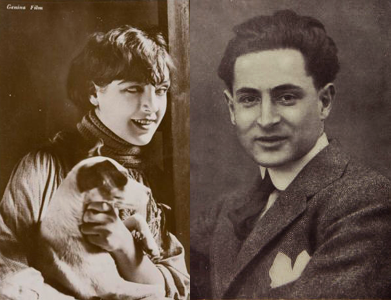 After founding Albertini Film in 1919, he produced both the Sansone series and the Sansonette series, starring his supposed wife Linda, whose true identity remains unclear. Linda Albertini is notable as a athletic heroine of the silent screen: the image of her above comes from Sansonette amazzone dell’aria | Sansonette, Amazon of the Skies (1920), in which she performed daring deeds on horseback, in water, and in the sky. Rina De Liguoro is often considered the last of the classic Italian silent divas. She appeared in several of the big blockbusters of the 1920s, including as the title character in Messalina (Guazzoni Film, 1923), Eunica in Quo vadis? (UCI, 1924), and Ione in Gli ultimi giorni di Pompei | The Last Days of Pompeii (Società Anonima Grandi Film, 1926). She played the title role in the 1930 version of Assunta Spina, and late in her life, appeared in Luchino Visconti’s adaptation of Il gattopardo | The Leopard (1963). 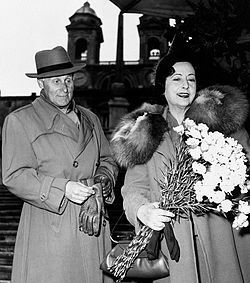 Her husband Wladimiro was the son of famous actor-director Giuseppe De Liguoro. Wladimiro directed his wife in four of his five directorial jaunts. I couldn’t find a picture of Amerigo Manzini, so have one of Italia Almirante instead. Italia Almirante Manzini was one of the great divas of the Italian silent screen, with a long and acclaimed career. Her most important role is probably Sophonisba in Cabiria (1914), but Italia went on to work at several of the major studios of the era, working with the leading talent of the time. I enjoy her work a lot! Her husband Amerigo Manzini was primarily a writer and theatrical actor, but acted on screen occasionally, including several times with Italia. He also directed a single film, La musa del pianto e quella del sorriso (Comedia-Film, 1917), in which Italia appeared. Hesperia isn’t highly reputed today, but she was a successful actress in her time, beginning in theatre and becoming a popular cinema actress by the mid-teens. Negroni, who came from an aristocratic family, passed through several of the main production houses of the 1910s: Cines, Celio, Milano, Tiber. 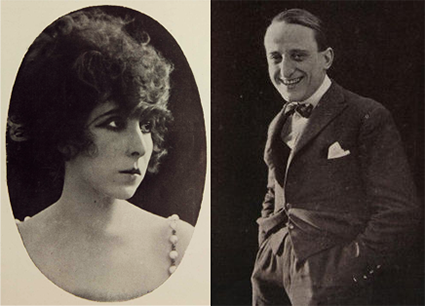 A prolific director, he is probably most well-known today for directing L’histoire d’un pierrot (Celio, 1914), an extremely charming and very successful film that starred Francesca Bertini—in a breakthrough role—as Pierrot, and Leda Gys as Louisette. 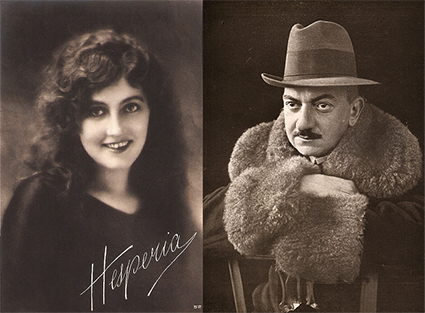 Negroni and Hesperia frequently worked together; the two married in 1923, after which Hesperia retired from acting. Mercedes Brignone had a respectable career as a film diva, also participating much in the theatre, the milieu in which she grew up. Few of her silent films are extent, and therefore the surviving title Il quadro di Osvaldo Mars | The Painting of Osvaldo Mars (Rodolfi-Film, 1920) looms large in our awareness of her today. It is, indeed an intriguing film. It’s hard to judge these things across such time, but I would call Mercedes Brignone a respected actress rather than a top-flight one. She made her talkie début in La canzone dell’amore (1930), the aforementioned first Italian sound film, and continued acting on screen, finding success in the ‘telefoni bianchi‘ genre. Her partner was Uberto Palmarini, a well-known theatrical actor and producer who sporadically made cinema appearances. Mari was notable as both an actor and director, acting alongside Pina Menichelli in Il fuoco | The Fire (Itala, 1915) and Tigre reale | Royal Tiger (Itala, 1916), and directing Eleonora Duse in Cenere | Ashes (Ambrosio, 1916), her sole cinematic outing. Mordeglia acted in just seven silent films, all directed by Mari; in the 1930s, she would work in radio, and make several TV appearances in the 1970s. 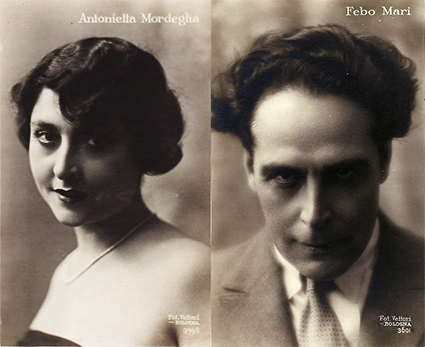 Mari and Mordeglia’s collaborations included Il fauno | The Faun (Ambrosio, 1917), which I’ve written about here. The duo did not marry until the late 1930s, after Mari’s first wife passed away. Fernanda Negri Pouget is an actress with whom I am notably fascinated—a more extensive post on her is forthcoming. Negri Pouget was a leading lady who nonetheless played character roles, specialising in offbeat characters. Her husband was French actor Armand Pouget. Honestly, his career seems rather minor: among his filmography, the main titles that stand out to me are the aforementioned Il quadro di Osvaldo Mars (1920), and the two Maciste films Maciste imperatore (Fert, 1924) and Maciste contro lo sceicco | Maciste in Africa (Fert, 1926). Lea Giunchi was an important early comic actress in Italian cinema, indeed considered Italian film’s first comedienne. As her comic persona, simply ‘Lea’, she appeared in over thirty-something films, causing anarchic mayhem wherever she went. 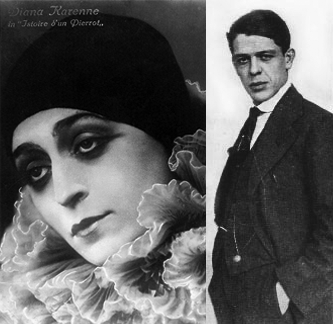 She partnered with several male comedians, including Ferdinand Guillaume (then known as Tontolini), from which sprung her solo series, and Kri Kri (Raymond Frau). Giunchi also performed dramatic roles, such as Licia in the seminal Quo vadis? (Cines/Kleine, 1913). Guinchi’s partner Natalino Guillaume was the younger brother of the more famous Ferdinand (Tontolini, Polidor); Natalino’s filmography includes a bunch of acting roles and three directorial credits. After Natalino died in an aviation accident in 1919, Giunchi retired from acting. Letizia and her two sisters Lidia and Isabella were all actresses, with Lidia having the highest profile due to her starring role as the title character in the seminal Cabiria (Itala, 1914). Letizia Quaranta was nonetheless a successful actress in her own right, appearing in several of the Maciste films among other titles. She was frequently directed by her husband Carlo Campogalliani, who is most revered for his sound-era career. And an honourable mention to Gero Zambuto and Claudia Zambuto (née Gaffino); unfortunately, I was unable to find a photo of Claudia, and only a poor one of Gero. The two started out as stage actors before being employed by Aquila Film in Torino, often working together. Gero also worked as a film director, directing fellow Sicilian Pina Menichelli several times; one of these collaborations is La moglie di Claudio | The Wife of Claudius (Itala, 1918), which I’ve written about here. Gero Zambuto was also a voice actor, providing the Italian voice of such diverse personalities such as W. C. Fields, Wallace Beery, Emil Jannings, and Charles Laughton. Postscript: blog note! I’d intended to do an end-of-2017 roundup post, but that ship has well and truly sailed now. Suffice it to say that this year, I’m aiming to post on a roughly monthly schedule, and I’ll generally be steering things in a more international direction than they’ve been in the last while. Thanks to all who read along! 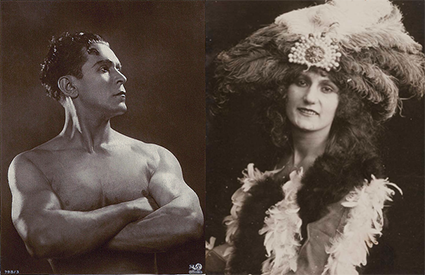 This entry was posted in Film, Misc and tagged André Deed, athletic heroines, Augusto Genina, Baldassarre Negroni, Carmen Boni, Carmine Gallone, cinema of Italy, Diana Karenne, Emilio Ghione, Febo Mari, Fernanda Negri Pouget, Gero Zambuto, Italia Almirante Manzini, Kally Sambucini, Lea Giunchi, Leda Gys, Linda Albertini, Luciano Albertini, Maria Gasparini Caserini, Maria Jacobini, Mario Caserini, Nietta Mordeglia, Nino Oxilia, Rina De Liguoro, Soava Gallone, Valentina Frascaroli. Bookmark the permalink. Thank you! Yep, I’m certainly a nerd about this stuff, haha. Outside of scholars who study these topics specifically, I’d imagine that few people are in this deep. Afterwards I realised that I forgot some couples, but this post is already super long … maybe I’ll tag on the extras at some stage. Sorry to bother about this, but Luciano Albertini wasn’t in Assunta Spina. Raffaele was played by Alberto Albertini, according to Vittorio Martinelli in Il cinema muto italiano, 1915, vol. 1.